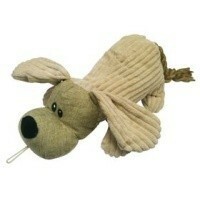 Danish Design Dylan the Natural Dog Toy is an adorable plush toy that your dog will love playing with. Made from high quality plush corduroy, this loveable character would make the perfect addition to any pet's toy basket. A luxury toy that will comfort and entertain your pooch at any time!